New London Welsh head coach Lyn Jones has named his squad for the Vauxhall Middlesex Charity Sevens at Twickenham on Saturday (July 9). Jones has named a strong squad of 12 with Wales’ 2009 Sevens World Cup winning captain Lee Beach set to lead the Exiles. The Middlesex Sevens also gives some of the club’s new signings a first opportunity to shine in a London Welsh jersey, with Will Hurrell, Gerard Mullen, Edd Thrower, Ed Jackson, and Mike Denbee all on display, along with summer trialist Ashley Smith. The experience is provided by former Sevens internationals Liam Gibson, James Lewis, Robert Lewis, Mike Hills, and Beach. The squad is completed by Ben Stevenson, who in the summer swapped his dual register with London Irish to become contracted to London Welsh. “The Middlesex Sevens over the years has been a terrific tournament and London Welsh have always performed admirably throughout the years,” said Jones. “We were delighted to accept an invitation to go along this year, and look forward to the boos, which we are traditionally afforded by the crowd. The tournament gets underway at 10:30am with the British Army v Apache, with all 16 teams in the men’s competition guaranteed at least two matches. Welsh begin their Middlesex Sevens challenge against a familiar foe in Championship rivals Plymouth Albion at 12:30pm in match number seven. Depending on the result, Welsh will either continue in the main competition or go into the Plate. If the Exiles lose to Plymouth they will be back in action at 2:10pm, however, if they win then their next game will be 3:45pm. Welsh have a long association with the Middlesex Sevens, a tournament the club have won on eight occasions, as well as finishing as runner up a further eight times. The club won its first tournament in 1931 but its best years came in the late sixties and early seventies when it won in 1968, 1971, 1972 and 1973, with a side boasting the likes of JPR Williams, Gerald Davies, current managing director John Taylor and club President John Dawes. The last time Welsh won the Middlesex Sevens was in 1984, with players such as Clive Rees, Bob Ackerman and Kevin Bowring. Welsh caused an upset in 2003 when they beat Leicester Tigers 26-12, only to lose in the next round to Bath, 31-24, in stoppage time. The club won the Plate competition in 1998, and were joint winners the following year with Wasps after a deluge forced the abandonment of the tournament before the final could be played. Jones, who led the Ospreys to two Magners League titles and one Anglo-Welsh Cup success, was confirmed as the club’s new head coach on June 6. He made a flying visit to London Welsh recently to meet players and staff, before returning to complete his commitments as Director of Rugby at the leading private school in Abu Dhabi, The British School Al Khubairat. 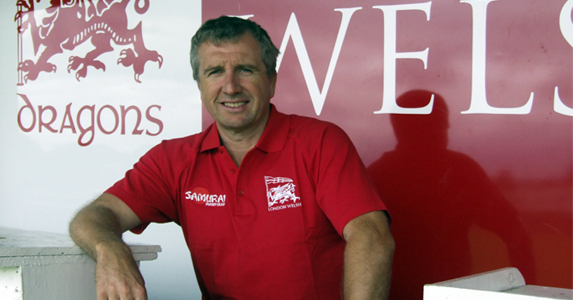 Lyn returns to London Welsh on July 6 to take up his new position.